The CEO of Sintetica Mendrisio has been presented with this prestigious award from CV-Magazine. “Most Influential CEO of the Year 2018 – Europe”. This is the new and prestigious award which Corporate Vision Magazine has presented to Augusto Mitidieri, CEO of Sintetica, the oldest pharmaceutical company in the Canton of Ticino. In presenting this award, which marks an additional milestone in the international recognition of the corporate strategy which Sintetica has been following under the leadership of its CEO, CV-Magazine focuses in particular on the elements that make up the “human-centric” philosophy which Mitidieri has brought to the operative and functional heart of the company. “Augusto and the team at Sintetica will continue to deliver their exceptional services which has seen them take great strides within the industry, leading the way for others to follow. Additionally, Augusto will continue to direct his team towards success with his award-winning leadership skills, especially following his recent recognition in Corporate Vision’s 2018 Leadership Elite Awards where he was righteously awarded to accolade Most Influential CEO of the Year 2018 – Europe”. A prestigious new addition to the list of awards won by Sintetica SA, the oldest pharmaceutical company in the Canton of Ticino, specialising in the production of top quality medicines for locoregional anaesthesiology and pain management. The firm's CEO, Augusto Mitidieri, received the European CEO Award 2018* for "Best CEO in the Pain Management Industry". The European CEO Awards 2018 recognise the leaders who have an eye for innovation and, having firmly positioned their companies at the front of the pack, are now shaping the industries they work in. "Mitidieri has shown a commitment to maintaining the firm's leading position within the global pharmaceuticals and pain management industry". One of Mitidieri's main ambitions has been to implement an organisational model based on responsibility and meritocracy, rather than rigid internal hierarchies. Such an ideal falls in line with Sintetica's aim to create a working environment based on innovative ideas and positive dynamics, resulting in first-rate products that help hundreds of thousands of patients worldwide. Most recently, Sintetica obtained marketing authorisation in the USA for its product Clorotekal, making it one of very few SMEs in the world to have registered an original pharmaceutical product in the country. * European CEO is a leading subscription-based print and online publication, delivered quarterly to c-suite executives in 28 countries throughout Europe. With a network of journalists reporting to headquarters in London, European CEO provides the numbers, detailed analysis, strategy and guidance needed to make qualified business decisions in Europe's diverse marketplace. Sintetica SA Named Europe's Pharmaceutical Company of the Year by Business Worldwide Magazine. The 2018 Brand of the Year Awards recognize and reward organizations that have performed exceptionally over the previous 12 months, becoming dynamic forces within their industries. The judging panel look not only for businesses of world class quality, but those that strive to push boundaries, challenge perceptions and respond to global problems; earning respect from their peers and becoming employers of choice. Sintetica SA impressed the panel with its clear commitment to ongoing development, innovation and "quality without compromise" - the company's mantra. This "people first" approach extends way beyond the staff team, positively affecting relationships with business partners and realizing the best possible care solutions for patients. Mitidieri's innovative new organization model, the 'Human Centered Organization', is based on the idea of responsibility and meritocracy rather than hierarchy, with managers moving from a role of command to a coaching style. Proving the Excellence of Sintetica. Sintetica is recognised at this years Le Fonti Awards. Many world-class forces of the economy gathered over an evening event and witnessed Augusto Mitidieri being awarded for the second consecutive year the prestigious award of CEO of the Year for Corporate Social Responsibility. For being an international force of excellence in the pharmaceutical sector, with particular reference to the treatment of pain. Thanks to its CEO's charisma and highly professional team, Sintetica has proven itself to be one of the fastest growing realities in the market and perfectly satisfies the CSR criteria. The motivation of this acknowledgement comes from the material representation of the spirit, envisioned by Augusto Mitidieri and embodied by the entire company, with which Sintetica manages its impressive expansion on the global market, strengthened by products of the highest quality and efficiency. The award of CEO of the Year for Corporate Social Responsibility is further acknowledgement of the excellent work Sintetica does as a whole. Sintetica SA - Best Pharmaceutical Company 2017 - Switzerland. Augusto Mitidieri of Sintetica is European Pharmaceutical CEO Champion. CEO of Sintetica SA Augusto Mitidieri is a worthy recipient of the Business Worldwide Magazine award Best CEO/Pharmaceutical Industry Europe 2017. Ultimately in charge of 230 employees spread across 25 different countries, his job is incredibly strategic, thanks to competition from emerging countries and long-term austerity measures Europe-wide. But it's not all doom and gloom for this talented CEO. That's because today there is more investment in pharmaceutical research and development than ever before. And Mitidieri is determined that Sintetica - whom he has worked with for the past 17years – will remain a leading player within the industry. The 95-year-old company develops injectable anaesthetics and analgesics on a global scale. These are specifically used for local anaesthesia, pain management and neuromodulation. Mitidieri regards development, production and marketing as crucial areas for the company's future strategy. Receiving his Best CEO Award from the magazine's executives, Mitidieri insisted that innovation within his industry wasn't merely about products, but also management style and organisation. "Getting this right has been one of the key elements of our success here at Sintetica"
Sintetica has its HQ in Switzerland, where it employs around 40 per cent of the company's total workforce. Other countries in which it has a base includes Germany, Austria, Italy and the United Kingdom. In order for sintetica to retain its global leadership peg Mitidieri believes strategic partnering and business development are the keys to long-term growth. "Our specialist sales teams in Switzerland, Germany, Austria, the UK and Ireland directly promote and market our products, while our Global Division delivers our top medicines through a network of strategic international worldwide partners" ex-lained Mitidieri, who is a graduate in Management Engineering from the Politecnico di Milano. He is hardly apologetic in admitting his 'pickiness' when it comes to choosing business partners. They must share the values of Sintetica, particularly its way of prioritising people and relationships over profit. "All our partners must meet strict ethical criteria and share our innovation-driven quality without compromising our value proposition"
As you would expect, Sintetica is a company which regards staff as a core resource. As such Mitidieri strives to offer a creative culture and doesn't even mind risk taking too much, provided it's what he would describe as "informed". "Making Sintetica a great place to work is our belief and is, in fact, part of our DNA." Resource of the year 2017. ACQ5 Awards - Growth Company of the year 2017. 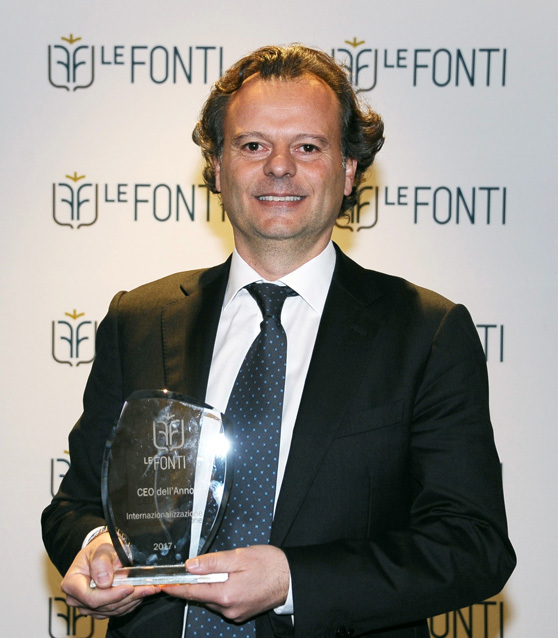 The prestigious Le Fonti Awards reward Sintetica’s CEO. This is decidedly a golden period for Sintetica SA, the pharmaceutical company from Canton Ticino specialized in products for pain therapy (www.sintetica.com). 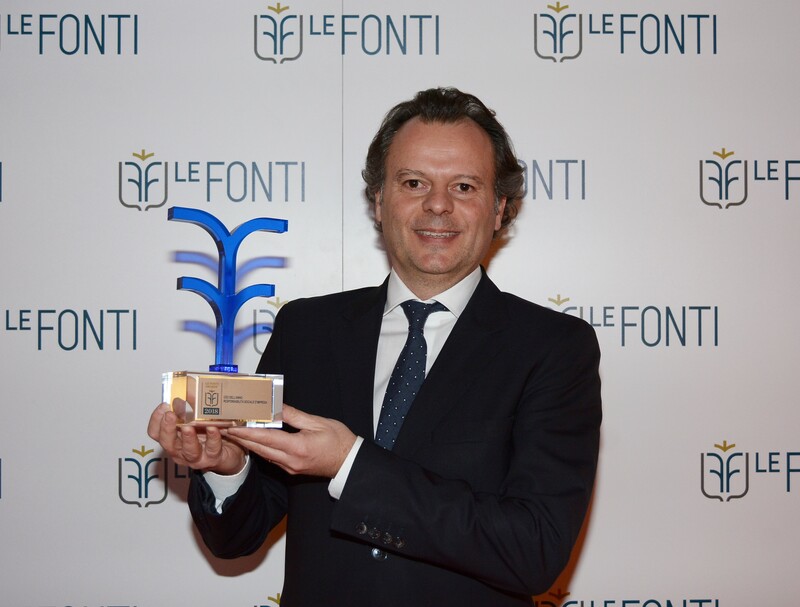 The CEO Augusto Mitidieri received a prestigious award in the internationalization category for the year 2017 from the Fonti Awards (www.lefontiawards.it). "For his capacity to lead with foresight and attention to human resources in the context of an international specialization in injectable products for pain relief and therapy. In particular, for having invested in the education vand continuous training of the employees in terms of the global standards for Corporate social responsibility and foreign development." The "Le Fonti" Awards are incorporated in the IAIR system of international awards, an event of great prominence for the business community. It reunites corporate leaders, legal offices and individuals from the highest tiers of the financial world. This new award refines the already impressive recent prizes bestowed upon Sintetica SA as Pharmaceutical Company of the year 2016 Switzerland and upon Augusto Mitidieri as European CEO of the year 2016. European CEO of the year 2016 Augusto Mitidieri - Sintetica. Sintetica® Pharmaceutical Company of the year 2016 Switzerland.